100% GUARANTEE - 100% Guaranteed to meet or exceed your expectations. If for any reason, you are not entirely satisfied with your results, simply return your order for 100% of your money back (minus shipping & handling). 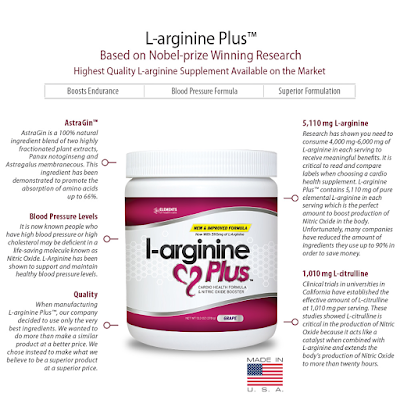 With L-arginine Plus®, you really have nothing to lose. AstraGin® - AstraGin is a 100% natural ingredient blend of two highly fractionated plant extracts, Panax notoginseng and Astragalus membranecous. This ingredient has been demonstrated to promote the absorption of amino acids and nutrients according to research found here. 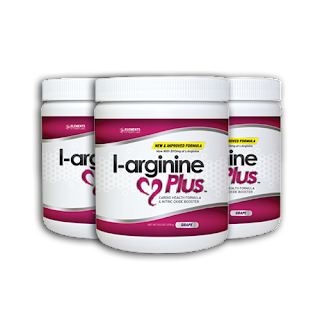 5,110 mg L-arginine - Research has shown you need to consume 4,000 mg-6,000 mg of L-arginine in each serving to receive meaningful benefits. It is critical to read and compare labels when choosing a cardio health supplement. 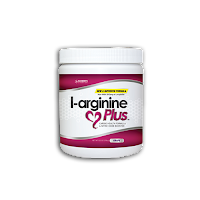 L-arginine Plus® contains 5,110 mg of pure elemental L-arginine in each serving which is in the "sweet spot" to boost production of Nitric Oxide in the body. Unfortunately, many companies reduce the amount of ingredients in order to save money. 1,010 mg L-citrulline - Clinical trials published in the "British Journal of Nutrition" have established the effective amount of L-citrulline of at least 1,000 mg per serving, twice a day. These studies showed L-citrulline is critical in the production of Nitric Oxide because it acts like a catalyst when combined with L-arginine and extends the body's production of Nitric Oxide. Because L-citrulline is expensive, some manufacturers include minimal amounts and hide that fact by saying it is part of their proprietary blend. 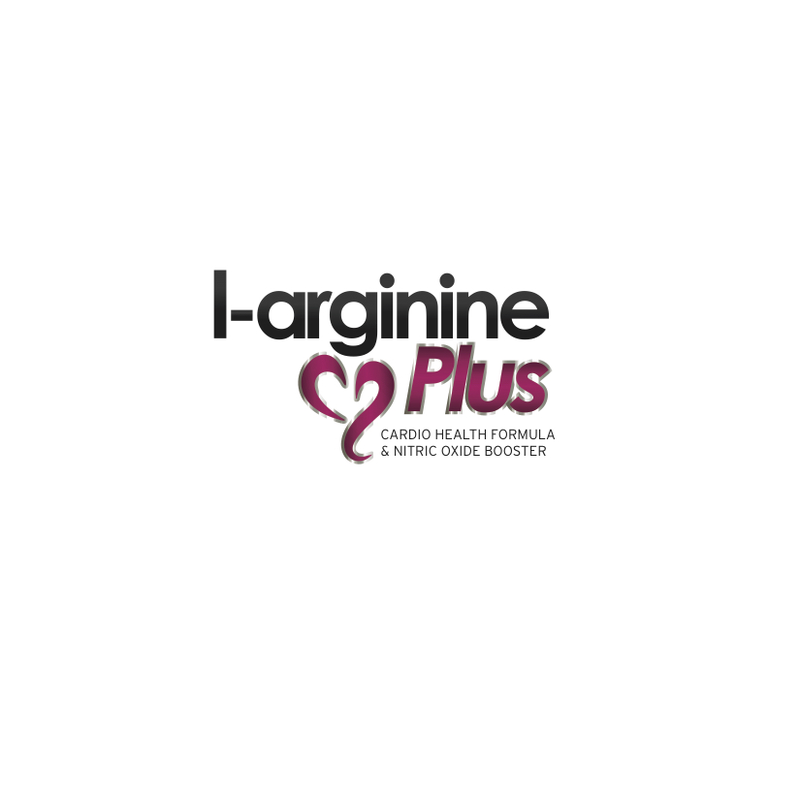 L-arginine Plus® is proud to say we use more than 1,000 mg in each serving. 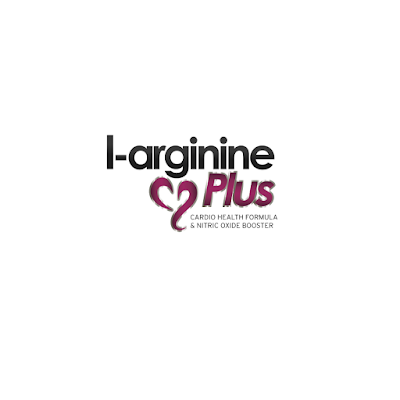 Made in th USA - Our manufacturer's scientists work closely with Elements of Healthcare to oversee the formulation, manufacturing and production of L-arginine Plus in a state-of-the-art manufacturing plant, with mechanical systems and quality-control mechanisms comparable to those used in the pharmaceutical industry. We are proud of this high level of attention to detail and highest levels of manufacturing excellence. Quality - In our manufacturing process, we use only high quality ingredients and produce each product in an NSF and GMP certified facility. L-Arginine Plus®is produced under pharmaceutical-grade production standards to ensure quality every time. We wanted to do more than make a similar product at a better price. We chose instead to make what we believe to be a superior product at a superior price. Because of that commitment, we buy only premium ingredients and manufacture our products in a highly controlled and monitored production environment. Furthermore, we test the quality and potency of every ingredient that enters our facility and every product that leaves our facility before it ever reaches our customers. I'm not much into protein shakes or drinking vitamin supplements, not because I feel they are ineffective but because they just don't taste good. 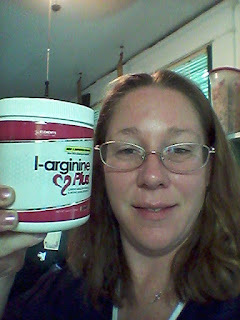 When I received the L-Arginine Plus, I was a bit skeptical. It came in a fairly large container and has approximately 30 servings per container. The flavor I was sent was the Grape. 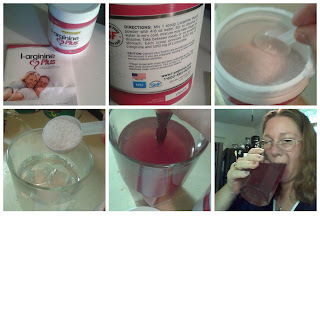 Mix 1 scoop (included)L-Arginine Plus powder with 4-8 oz water. Stir to dissolve. If water is very cold, mixture may take longer to dissolve. Take between meals or on an empty stomach. 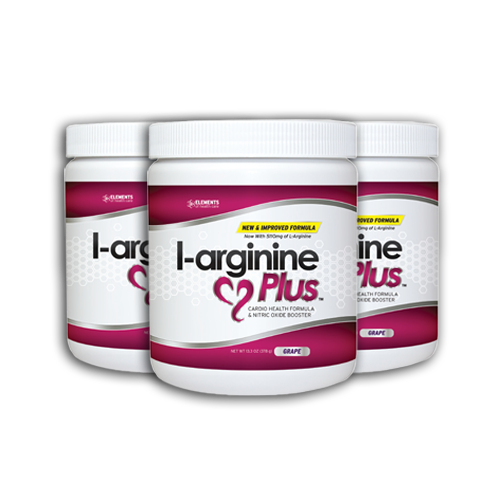 Each scoop provides 5,110 mg of L-Arginine and 1,010 mg of L-citrulline. The powder mixed very well in the cool water. I added ice after mixing because it stated it may not mix very fast in cold. I truly expected the L-Arginine to taste as bad as others I have tried, but I was pleasantly surprised at how good it actually was. The benefits of this product are amazing! My question is, with so many health benefits, why wouldn't someone want to try it! And it tastes great too! I would definitely recommend this to anyone wanting to better their health! Purchase this product on Amazon! 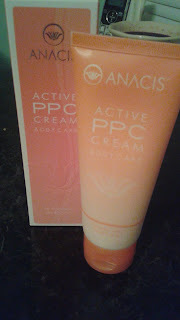 Active PPC Revolutionary cellulite reduction increases skins smoothness and fights fat cells from within. Defining Gel Active PPC anti Cellulite Cream it works for Firming Tightening Beauty From Within ACTIVE PPC MOTION NON-INVASIVE BODY CARE METHOD. 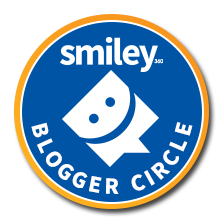 I was extremely impressed with this product. I really didn't expect it to work so well due to the fact that I have tried other products and have been very disappointed. This has not completely gotten rid of my cellulite but it has done an amazing job at reducing the amount visible on my body. it took about a week for me to see any results and they were very subtle at first. but after the second week I could really notice the difference. 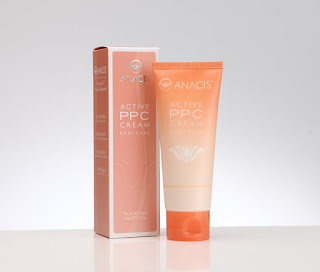 The cream is a little thicker than a lotion but not so thick that it leaves a film on your skin. It absorbed fairly quickly and left my skin feeling smooth. It has an amazing smell to it too. I really enjoyed that I could apply a cream that not only reduces my cellulite but also smelled good! I would recommend this to anyone who is looking for a product that actually works in reducing the look of cellulite on the body. Purchase this item on Amazon! 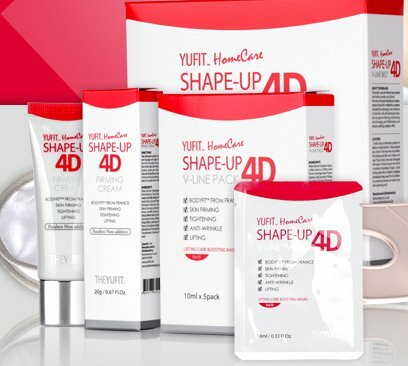 Contains: 1 Adjustable Face & Neck Plastic Surgery Compression Garment Face Line Shape Up 5 Expert Face Line Pack 0.4oz/12ml 1 Expert Firming Cream 0.67oz/20g It's an easy treatment home care product, which will give you a smooth and clear face line when you use this product repeatedly. The 3 step process will provide nutrition and moisture to your skin. Making your skin feel moist, smooth and radiant. Product can be used 3 to 4 times a week to achieve desired effect. I love this firming kit, although I was a bit intimidated by it at first, once I put it on for the first time I was hooked! The kit came with a chin strap, 5 nourished chin patches, and firming cream. 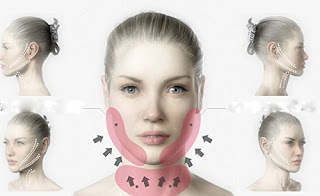 The chin strap aids in keeping the patches in place but also helps to lift the jawline. It is recommended that that patch stay on no longer than 40 minutes. The patches are packed with nutrients essential for keeping the skin hydrated and tightened. 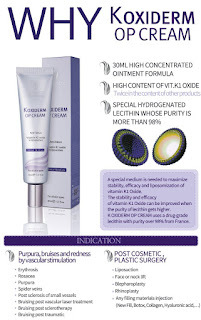 The firming cream is used both in the morning and at night and when applied tightens and firms the skin. The combination of all three products makes a huge difference. Yes, they can be used separately but together, does so much more! I would definitely recommend this to others! 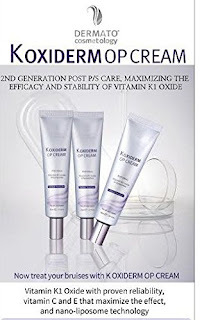 K Oxiderm OP cream cream is good for many different things. Just had surgery? Need help healing your bruising quicker ? Tired of those dark under eye circles that won't go away ? Would like help to get rid of spider veins and varicose veins ? 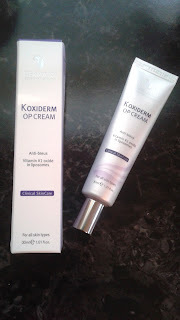 Whether you need to fix some skin imperfections K Oxiderm OP cream can make it easier !!!! 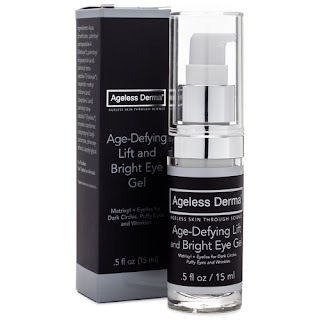 Treating the dark circles that are majorily caused due to aging process . 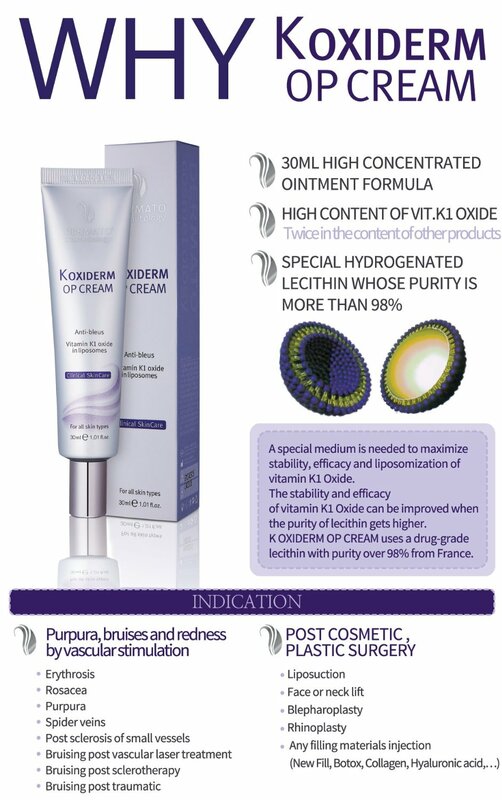 This is a great cream for those planning on having some sort of plastic surgery done. It has high quality natural ingredients in it that not only preps the skin before hand but also helps aid the skin in the healing process. The cream it'self has hardly any scent to it and disappears while you rub it into the skin. It absorbs quickly so you don't have to worry about it getting on your clothes or furniture. 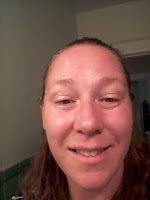 It leaves the skin feeling soft and I had no issues with irritation from the product. The tube is easy to use. Just take off the lid, squeeze the desired amount onto the area of skin you prefer and rub in. The lid then fits tightly back onto the tube so you don't have to be worried about leakage. I feel that because of the natural ingredients it will help aid in the healing process after surgery. I also feel that it can help in other areas of the skin such as deep cuts and scratches as well as dark circles. This product however is NOT recommended to be applied directly to a wound. Rub cream into the skin around the area effected. I would recommend this product to those who are looking in getting surgery done soon or for those who may have slight issues from aging. Your search for the perfect large cat litter mat is finally over. 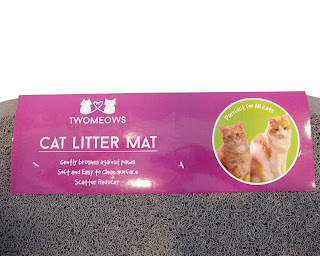 When you purchase Two Meows cat litter catcher mat with scatter control today here's what you should do. When your colorful cute paw shaped mat from Amazon arrives at your door, take it out and admire all the characteristics that will make this one of the last litter mats you'll ever need to own. Now place it in front of your litter box, or if your meow has a favorite non-traditional exit from the box place it there. If he/she uses multiple exits use a mat for each side. Marvel at how effective it is at capturing litter right off your cats paws. 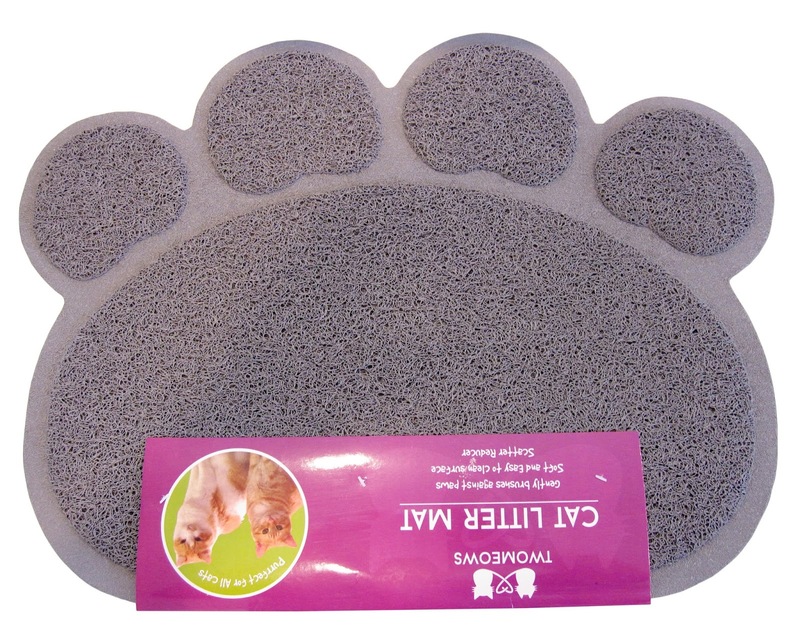 Watch your cats enjoy walking across the soft and squishy material kneading their paws on it and sleeping on it, stories shared with us by other customers. What separates Two Meows cat litter mat with scatter control from competition? It's simple. It starts by how we selected high quality premium material to most effectively prevent litter throughout your home while keeping your cats happiness in mind. This is what makes up our exclusive TM-7 litter catching system. The TM-7 technology in the Two Meows mesh design is truly scientific. Others have attempted this type of weave however the results are a stiff mat that can be rough and abrasive on your catÕs paws. 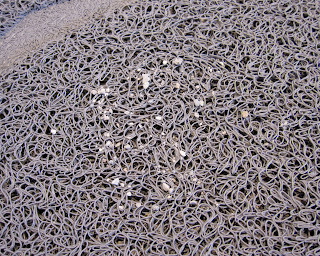 It's because of this that we're able to make a guarantee unlike any other you've seen for litter mats. We call it our better than money back guarantee and here it is. Try our litter trapper mat and if you don't fall in love with seeing less litter mess and less time cleaning or don't feel it was worth every penny of your investment today, we'll refund your money. 1. It significantly reduces litter scatter around the litter box area. 2. It reduces litter being tracked throughout your home in the carpet and furniture. 3. It’s easy cleaning. 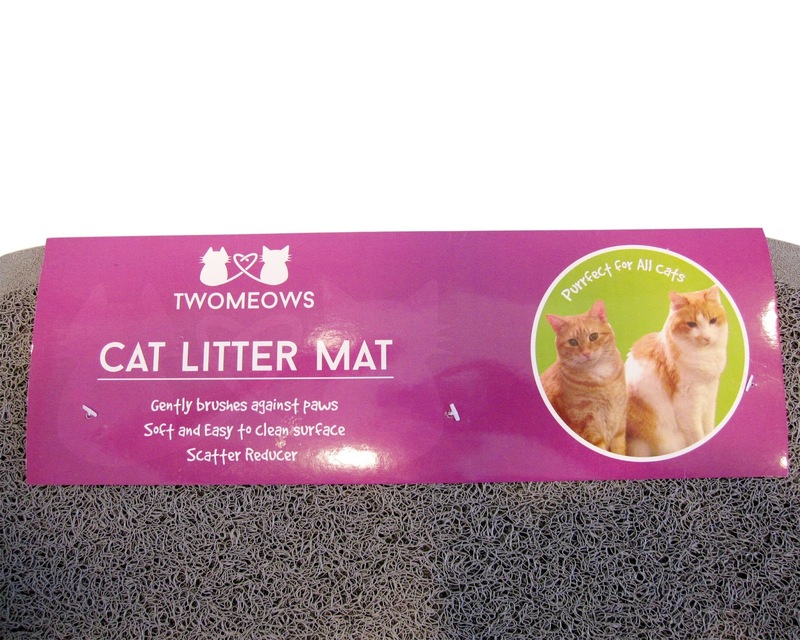 The mat can be folded to shake litter back into the box. 4. It can be rinsed. 5. It’s soft on your cat’s paws (beware, there are other mats that look similar but “not” soft like ours is). 6. We utilize more premium material so it’s long lasting. 7. It’s a non-slip grip on the back so it stays in place. 9. It doesn’t trap odors like cloth mats. 10. We offer a 100% satisfaction guarantee. I love the design of the Two Meows Cat Litter Mat! It's large paw shape is a perfect fit in my household and looks great in front of the cat littler box! I have 2 cats and they constantly throw litter out of the box onto the hardwood floor. The litter gets stuck between the cracks of the hardwood and is a pain to get out. The mat makes it so much easier to clean up after my babies! 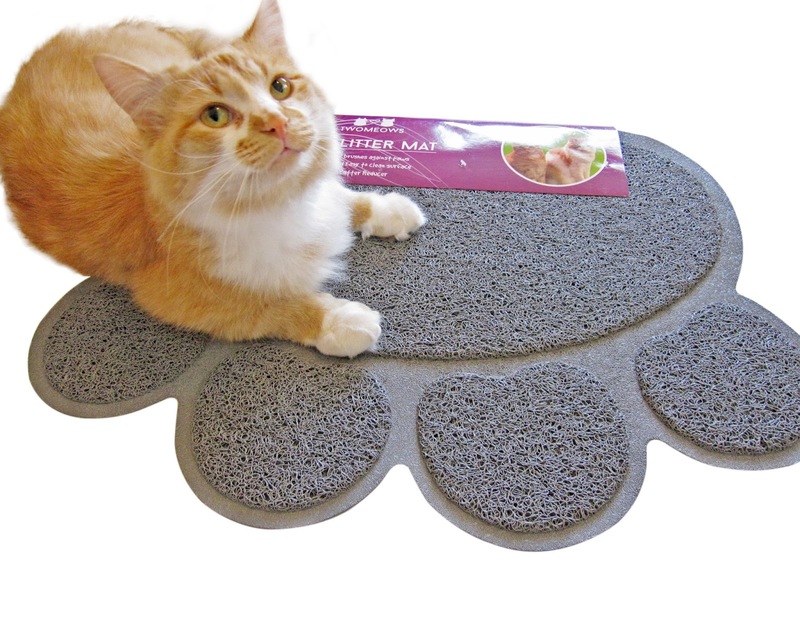 The material that the mat is made with is durable and doesn't irritate my kitties paws. It looks rough but when I stepped on it with my bare feet, it was actually pretty soft and didn't poke at my feet. It stays in place very well and didn't slide around on the hardwood. The bottom of the mat has a rubbery product that helps it to stay where you place it on the floor. 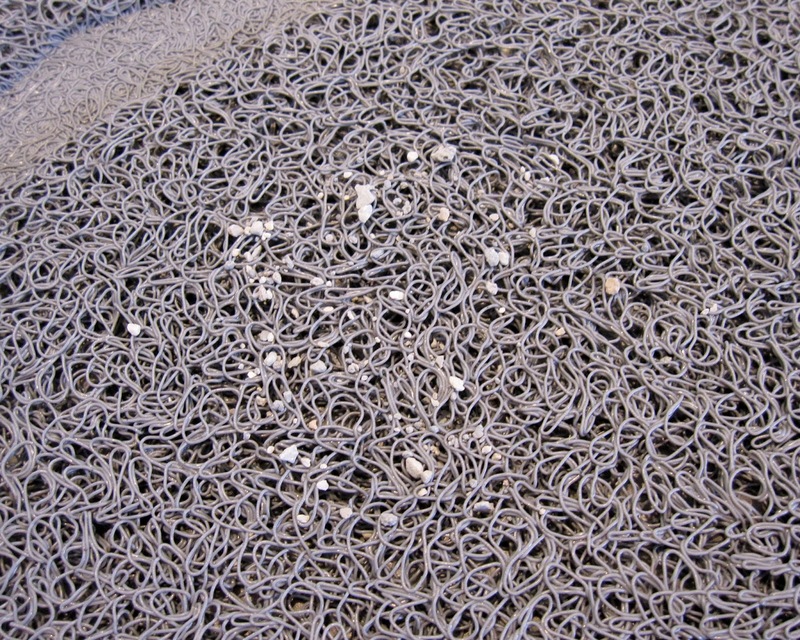 The top layer of the mat held the cat litter that was discarded outside of the litter box extremely well. It seemed to fall into the mat so it wouldn't eventually make it to the floor. When cleaning the mat I found that all I had to do was simply pick up the mat and shake it a little over the garbage can and all of the litter fell off of the mat. Super easy. I love how simple this mat is to use. The design adds a little character to the cats area of the house and is functional at the same time! The material is durable and I feel this will last us for a very long time!! I would recommend it to anyone who has feline family members in the house! When you have a new born or a small child, you want to make sure every aspect of their life is safe and protected! Bath time should be no different. While the water may feel OK to us, our babies skin is much more sensitive to things. 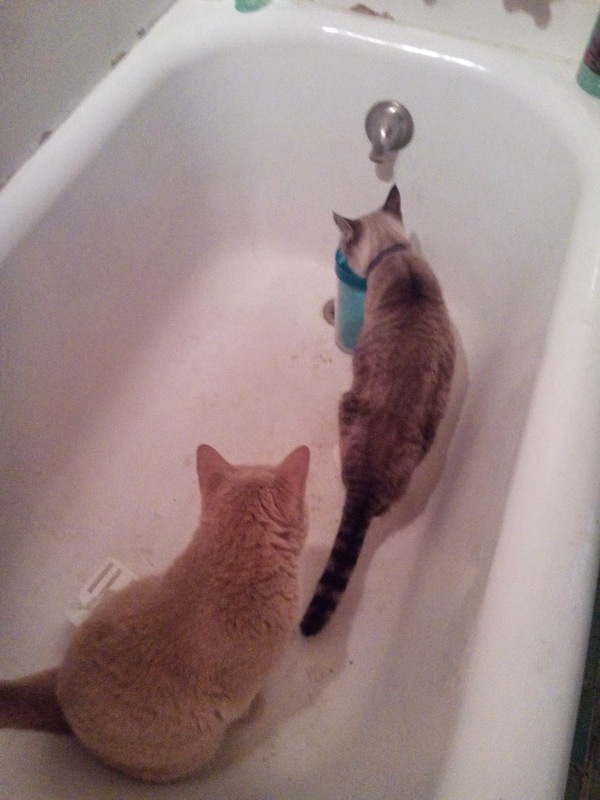 So making sure the bath water is at a safe level is very important. This Duckymeter not only makes for a fun experience but it tells you what the water temperature is! 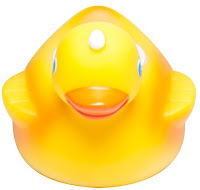 When I first used the ducky, I simply just placed it in the water and it turned on. It's nice not to have to remember to turn on a switch to use the product. After I was finished using it, it simply turned it'self off. 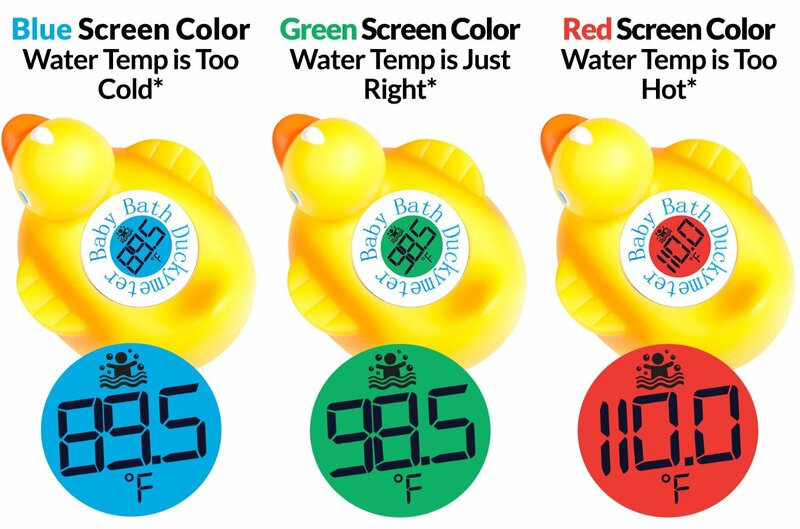 I also really appreciated the fact that it has 3 different color codes to let me know if the water is too cold, too hot or just right! This makes it super easy so I can adjust the water accordingly! 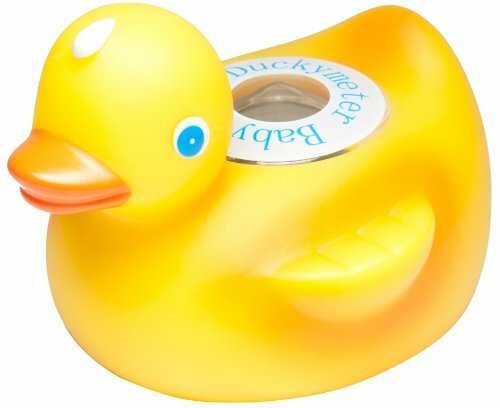 The Ducky Meter came with batteries included, so I wasn't scrambling around to find any in the house. I just had to take it out of the package, read the instructions and put it to use. 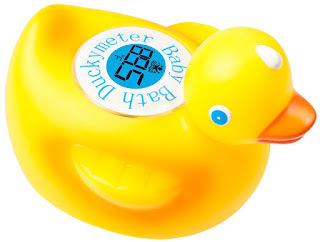 I did test the water with another thermometer to see if the Ducky Meter was accurate and was a little surprised that it was a few degrees off. It would show a lower temp than the thermometer I used to test. I would suggest when first using the product to test the water to see if there is any difference. That way when using the ducky you can make the mental adjustment when the ducky is placed in the water. I really enjoyed trying this product and think it's a great way to monitor the water temp when bathing young children! It gives them visual stimulation and something fun to play with while in the tub! 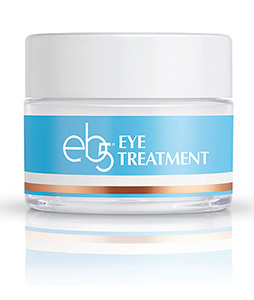 How to use: Use this exquisite Eye Treatment both morning and night by patting a small amount around the eye area. Smooth gently, avoiding eyes, lids and lash line. Discontinue use if irritation occurs. Regu-Age PF-Works to protect delicate eye area skin from oxidative stress, strengthen and protect the collagen and elastin matrix, improves circulation helping smooth lines and wrinkles. Steviocide, known as Stevia-A 100% natural and powerful active ingredient that minimizes the tension of smooth muscles and the creation of furrows, wrinkles or lines. A very small concentration is needed for visible results *after 7 days. Leaves the skin appearing smooth, serene and regenerated. 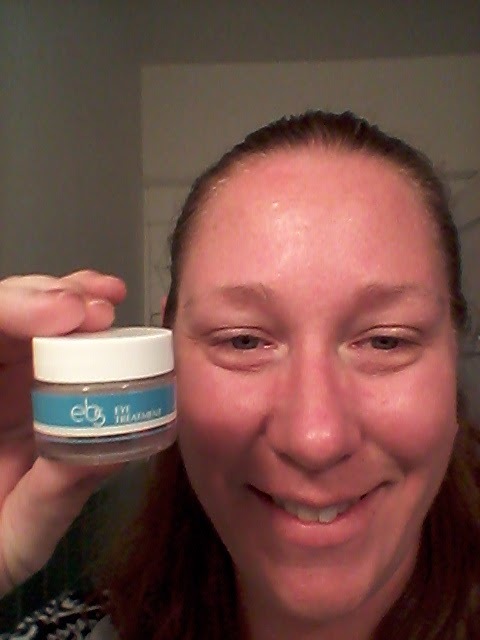 I have previously tried the eb5 brand and I truly loved the product. So when I was asked to try another product I was very happy to do so! I have been using the eye cream for a little over a week now and I love the way it leaves my under eyes feeling! When I apply the cream it leaves my skin feeling moisturized and cool. It has reduced some of the puffiness I get from lack of sleep and brightens the skin around my lids. 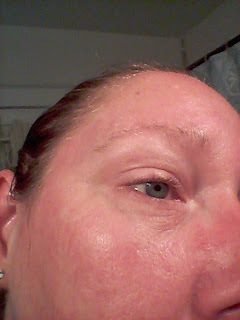 The cream has not irritated my skin in any way, nor has it left any redness to the sensitive areas around my eyes. I would recommend this to anyone wanting to reduce the fine lines and puffiness around the eyes! This book is absolutely amazing! I didn't want to put it down until I was finished reading it! Hannah's childhood is filled with hatred and abuse. Finally fed up with her father, she attempts to free her family but fails. Her father is sent to prison for almost killing her. After losing her mother to alcohol she moves her and her sister to Seattle and starts a new life. She meets the man of her dreams, or so she thinks. He has other plans up his sleeves. In a vicious circle of twists and turns, Hannah is forced to leave everything she has known for the past few years. Not knowing the true reason for which she is hiding. 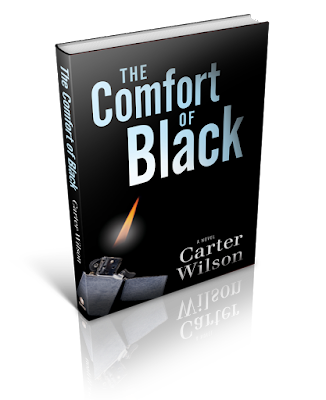 In the process of all the confusion, she meets a man named Black who says he is there to help her. But finds that he is all part of the plan. The only person she thought she could trust was all part of the plot to make Hannah disappear. Will she be able to run from the life she has always known or will the one out to get her succeed? Throughout the book there was never a place where I wanted to close the pages. There was so much excitement and twists that I could never tell who truly was behind the plot, until the end of the book. I felt my heart racing is so many parts of the book, it was that exciting! It did not end as I expected and was totally surprised at the ending! There is violence and harsh language in this book and is not recommended for young readers. I would recommend this to anyone who loves a great action filled book with a lot of twists to it! Instantly Ageless™ is a powerful anti-wrinkle microcream that works quickly and effectively to diminish the visible signs of aging. Instantly Ageless™ revives the skin and minimizes the appearance of fine lines and pores for a flawless finish.Instantly Ageless™ immediately dissolves into the skin, reducing the appearance of wrinkles. 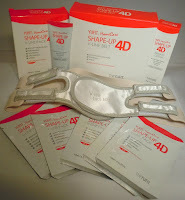 It’s specifically designed to target areas which have lost elasticity—revealing visibly toned, lifted skin. Users have seen dramatic results in seconds.Lightly pat a very thin layer to targeted areas; leave damp on skin and remain expressionless for 2–3 minutes while product dries to achieve dramatic results. Instantly Ageless™ immediately dissolves into the skin, reducing the appearance of wrinkles. 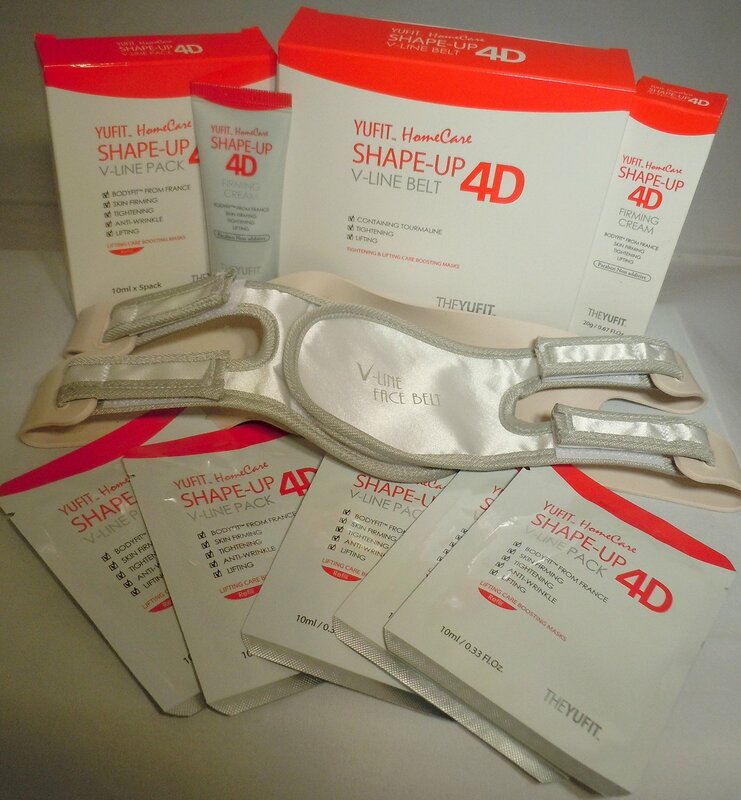 It’s specifically designed to target areas which have lost elasticity—revealing visibly toned, lifted skin. Users have seen dramatic results in seconds. Watch fine lines vanish. * A compact, yet powerful alternative to fortify skin a ected by free radicals and environmental damage, Instantly Ageless™ is at the forefront of anti-aging technology. 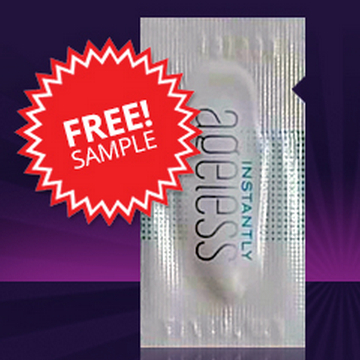 Stop waiting for results—live flawless with Instantly Ageless™. 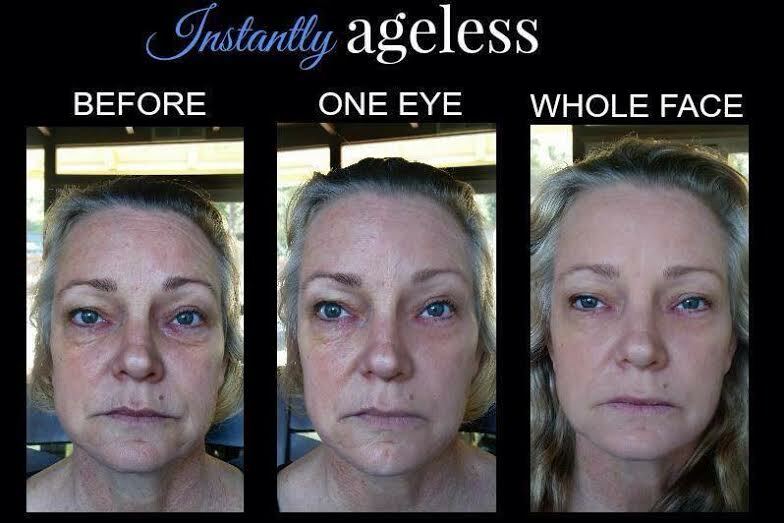 I have seen many people posting great things about the Instantly Ageless product but have never been able to try it. It's been sold out every time I tried to purchase. So when I got the chance to try it free I was extremely excited! I want to assure you right now that this product is absolutely amazing! The name is perfect for the product because it truly is instant. When I applied the cream to the bags under my eyes, within literal seconds it was already working! 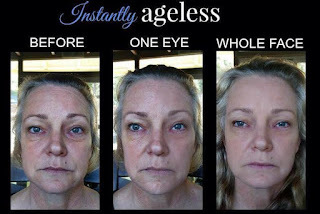 I have never seen nor used anything such as Instantly Ageless before. The other great factor to this product is that is doesn't fade as fast as it works. No, it does not last forever unfortunately. But I applied the cream in the morning before work and my bags were still gone when I came home from work! 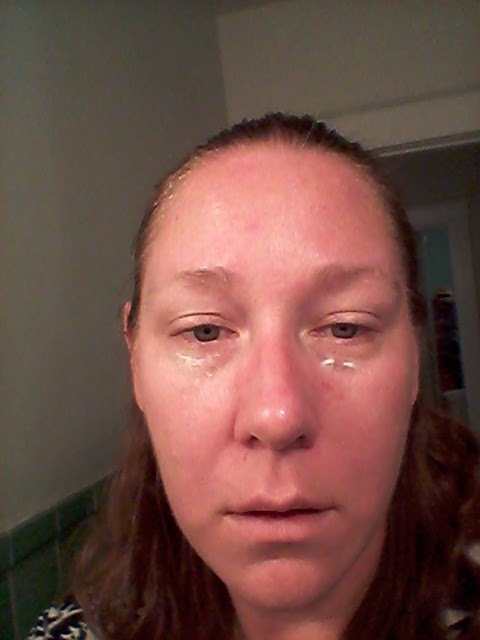 Not only did it work to reduce the bags under my eyes but I also used it on my face to see what it could do to reduce the pore size. You can see in the pictures below the results! This is such an amazing product and I will be purchasing more for myself and would recommend this to absolutely everyone!!! 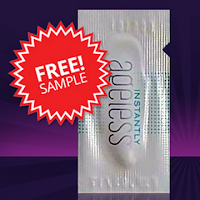 Enter below for a chance to win a sample of Instantly Ageless and see the results for yourself!! The Ageless Derma comes in a simple box which I truly appreciate. I don't like products that try to sell the box and not necessarily the product inside. 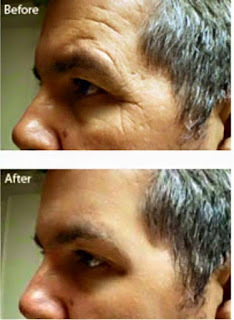 I feel that Ageless Derma is all about the product and not the package it comes in! The bottle inside looks just like the package it's sent in. It has a tight fitting lid that snaps on and off easily. I really like the pump feature on the bottle, however mine was not working and I had to take the pump off in order to use the product. 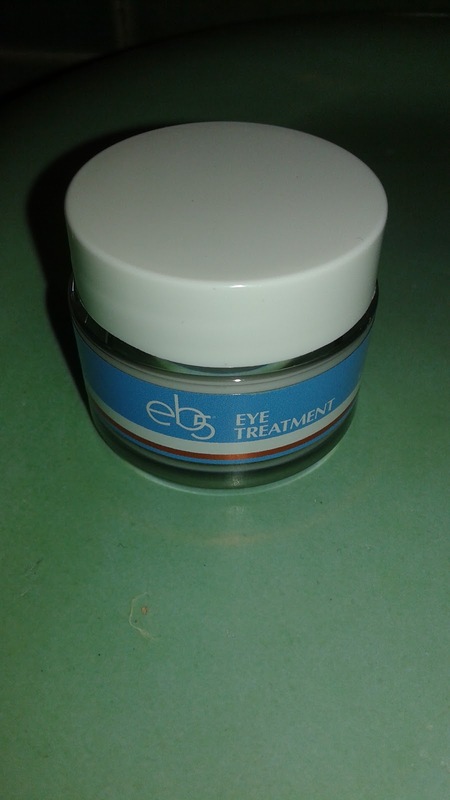 The eye gel had a light almost floral scent and was very pleasant. 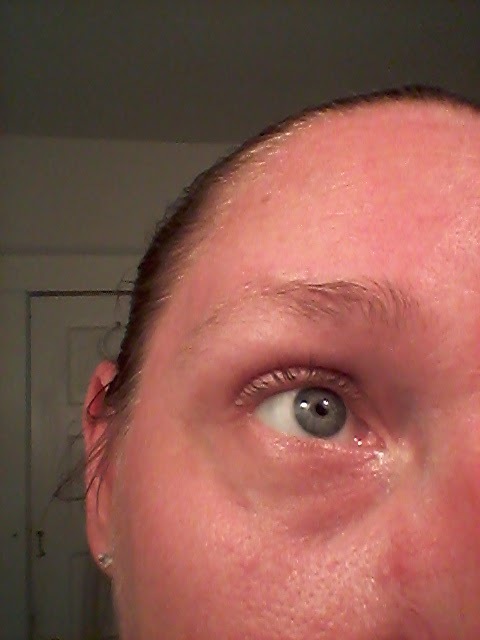 It is almost clear in color and applied easily to my under eye. After it was applied, it felt soft and soothing and absorbed fairly quickly. It didn't leave a residue or greasy feeling under my eyes and felt smooth and soft. It didn't irritate my skin at all and I was able to wear this under make up without issue. I really like the Ageless Derma Eye Gel and think it will do great things over a period of time! The only issue I had was that the pump on my bottle did not work but other than having to take the lid off to use the product I had no complaints! I would recommend to others!